Florida Power & Light Company (FPL) engineers work at the Power Delivery Diagnostic Center at the company’s office in Jupiter, Fla., March 17, 2015. 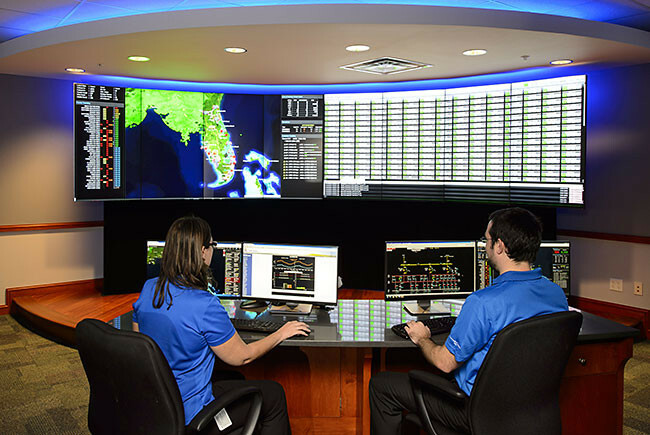 FPL's new Power Delivery Diagnostic Center provides real-time data to the company’s engineers in its diagnostic center so they can measure and improve the performance of the electric grid. Florida Power & Light's new Center is a state-of-the-art diagnostics hub aimed at improving reliability. 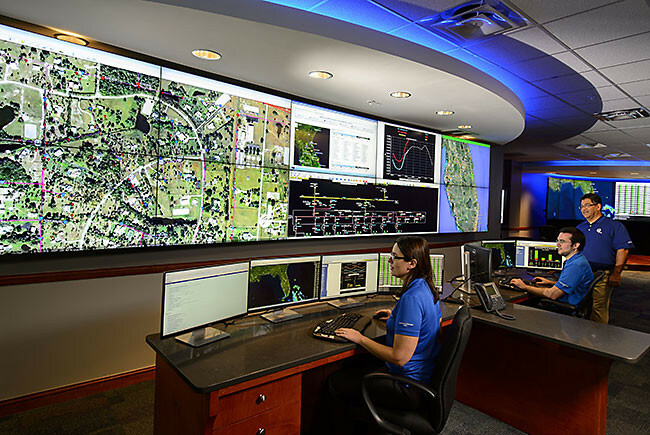 Florida Power & Light Company (FPL) today announced the launch of its new, high-tech Power Delivery Diagnostic Center, which is designed to leverage advanced smart grid technology to better manage the electric system and deliver reliable service that ranks among the best in the nation. FPL is investing in smart grid technology and using predictive analytics to deliver real-time data to engineers in its diagnostic center. Engineers, in turn, analyze the data to measure and improve the performance of the electric grid. FPL began modernizing its system in 2010 with the widespread installation of smart meters, funded in part by a $200 million grant from the U.S. Department of Energy. Since then, FPL has invested an additional $600 million, installing more than 12,000 smart devices and thousands of sensors and monitors on transformers, breakers and battery banks. The company is also investing in digital microprocessor technology that provides real-time telemetry and fault information – helping the company quickly identify and locate potential causes of outages. “While other utilities are on the doorstep of a technological leap that will set new expectations for how companies handle reliability, FPL is already a national leader,” said Jeff Lewis, PA Consulting Group's ReliabilityOne™ program director. “FPL has kept the needs of customers at the forefront of its system improvements, hinging its business success on maintaining the highest standard of reliability." Smart meters help FPL run its operations more efficiently, delivering more than $30 million in operational savings in 2014 alone – savings that help FPL keep bills low for customers. More savings come from a reduction in the number of times FPL crews have to make trips into the field to perform work – 170,000 fewer field visits through 2014. Customers also benefit from faster, more convenient service connection and disconnection when opening or closing accounts. FPL recently filed its annual 2015 Smart Meter Progress Report with the Florida Public Service Commission, outlining 2014 achievements. “We have made remarkable strides in our ability to monitor and manage the electric system today compared to even a few years ago. Now we can detect and prevent many issues before they become problems for our customers, and when outages do occur, we restore power quicker and get life back to normal faster,” said Miranda. Investing in smart grid technology is part of FPL’s commitment to building a stronger, smarter grid while giving customers unprecedented ability to gain control over their energy use. FPL launched its online Energy Dashboard, where customers monitor and assess their energy use to help lower their bills. Last year, customers accessed the Energy Dashboard more than 3 million times. FPL continues to enhance dashboard features and improve functions for its business, net-metering (solar) and time-of-use rate customers. In 2014, FPL won the Smart Grid Project of the Year Award at the DistribuTECH Awards held by POWERGRID International magazine, and a 2014 ReliabilityOne™ award in the category of Outstanding Technology and Innovation in the U.S., awarded by PA Consulting Group.